Business Process Modeling has become a valuable process in modern business, but why exactly does BPMN 2.0 set the standard? We take a look at the brass-tacks benefits of BPMN certifications and how they could be used to transform your organization. Contact Good e-Learning today to find out more! As an organization scales up, its essential processes will inevitably increase in complexity. Decision makers find themselves with more factors and angles to consider, more responsibilities to juggle and, if they aren’t careful, an upsurge in silo thinking as individuals focus more on their own goals and priorities. Needless to say, this kind of situation is extremely counterintuitive, and not just when pursuing large scale projects. Even day to day operations can needlessly drain time and resources when employees fail to grasp the big picture. You could find that your business is hemorrhaging resources and dragging work out, and you’d struggle to find out why. Business Process Model and Notation (BPMN) is a standardized graphical language designed to display complex business processes in an accessible visual format. A BPMN diagram will present activities, gateways, events and flows (each with their own variations) in a way that simplifies any and all processes. Not only does this provide a much greater level of clarity when looking at operations from a management point of view, but it can also enable employees to understand how valuable their work is in pursuing shared objectives. BPMN 2.0 sets the standard for Business Process Modeling (BPM) and has seen widespread use in industries around the world. Unfortunately, many of the benefits of studying BPMN are long-term in nature, making it a somewhat difficult product to sell. With that in mind, let’s take a look at the most important things to keep in mind when selling BPMN to your organization. One of the biggest advantages that BPMN has to offer is its accessibility. BPMN diagrams can vary in complexity, to the extent that even those who are new to business process modeling can understand them at some level. Indeed, you’d lose the advantage of process mapping altogether if you made the diagrams too impenetrable to understand! This accessibility also extends to helping users comprehend processes which they may not otherwise be familiar with. For example, a less technically minded executive could enjoy a greater understanding of essential IT processes when they are presented with BPMN. At the same time, the BPMN graphical language is general enough that it can be applied to virtually any department, industry or sector. In other words, anyone can make use of it! BPMN diagrams allow employees to enjoy a much greater sense of perspective regarding complex business processes. Users know how things work, who is responsible for what and, most importantly, which processes have the potential to be improved. Process improvement is relevant both for day to day tasks and significant projects or initiatives. By clearly mapping out any and all processes from beginning to end, including any non-standardized workarounds that people may have come up with, it will be far easier for you to highlight areas where fat can be trimmed, or where additional resources need to be assigned. By approaching processes in this way, you can enjoy faster results, reduced wastage and even greater quality, all adding up to a much-improved ROI. ‘Silo thinking’ is one of the biggest barriers to efficiency and productivity in modern organizations. With a lack of awareness and cooperation between employees and departments, individuals will usually end up focusing more on their own needs and priorities. They will start to think about what works best for them, rather than the organization or its clients. A comprehensive business process diagram will have all connected processes mapped out. This makes it far easier for different groups to see how their work affects others and how everyone is contributing to shared goals. With this level of awareness, staff with different backgrounds and perspectives will be able to collaborate more effectively, aligning their actions and priorities in a way that fully supports greater business objectives. As we mentioned earlier, BPMN models can vary in complexity. With a more detailed understanding of the language, users and business analysts are better able to comprehend the more subtle complexities of individual processes. This level of awareness can leave BPMN practitioners better equipped to actually implement processes in practice. In understanding the connectivity between processes, where responsibilities lie for individual tasks, where collaboration will be necessary, and so on, they can take on invaluable management roles. In the modern world of business, it is important to be ready to adapt, whether out of necessity or simply to take advantage of new opportunities. This naturally requires an understanding of your essential processes, as this will allow you to pinpoint where changes can take place and why they will be beneficial. Keep in mind that change is a constant these days. New technology, circling competitors and even updates to methodologies like TOGAF and ITIL ensure that there are always opportunities to evolve, and taking advantage of them is essential for staying on top. Without a full understanding of what you have to work with, however, attempts at change will inevitably become dragged out, wasting both time and money. As loathe as some may be to admit it, businesses cannot operate without adhering to compliance laws. Developments such as GDPR have reiterated this about as subtly as a punch to the face, with non-compliant organizations risking serious fines, delays and even reputational damage. Using BPMN tools effectively, it is far easier to build compliance initiatives into your core processes. The practice also encourages reporting and automation, which you will be thankful for if you ever need to provide evidence of your efforts to achieve compliance. Remember, to avoid the largest fines you must be able to prove that you have taken the right steps to make your organization compliant. Investing in BPMN training now could provide a huge saving later on! Most people have worked in at least one job where a lack of motivation prevented them from putting everything into their work. One of the most common reasons for this is simply not understanding the value of our work in relation to higher level objectives. From our perspective, we wonder why we need to spend time on seemingly unnecessary or inefficient tasks, while others may treat us as being more expendable and reallocate resources accordingly. Why Gain a BPMN Certification with Good e-Learning? Good e-Learning is one of the world’s leading online course providers. We have an award-winning portfolio covering a variety of popular corporate standards and frameworks, including TOGAF, ITIL 4, Lean and BPMN. With our team of in-house experts, not only are we able to offer these courses at competitive prices, but we can also provide students with 24/7 tutor support. Our goal is to make corporate training easily accessible online. Students can access our courses on any web-enabled device, including phones and tablets. We also offer a number of engaging learning tools to help students along, including motion graphics, gamified quizzes, interactive videos and audio-tutors. Best of all, with months of course access, it is easier for students to find time for training, even in full-time schedules. While there is no official exam to take, students will receive a certificate of completion upon finishing the course. The expertise on offer can also be highly lucrative, with some students reporting a 21% increase in their earning potential after studying BPMN. Want to find out more? 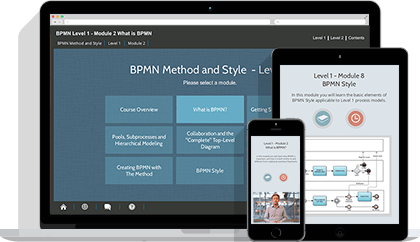 Get in touch with Good e-Learning today to learn how we can set you on the path to your BPMN course!